Garry Monk is gunning for Sunderland in Sunday’s Wear-Tees derby as Middlesbrough chase a third successive Championship win. Boro made it back to back away victories with last night’s impressive 3-1 success at Hull. Boro's Cyrus Christie helped clinch three good points at Hull last night. 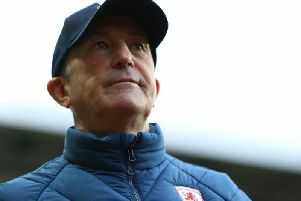 Boro had clinched their first win in six Championship matches at Reading on Saturday and they made a fine start against the TigersMartin Braithwaite fired home after 13 minutes. Britt Assombalonga put them two goals to the good before half-time. Subs Kamil Grosicki pulled one back with a sumptuous finish in the 72nd minute, but ex-Sunderland midfielder Grant Leadbitter’s late penalty, after Ashley Fletcher had been fouled by Michael Hector, killed off any hopes the Tigers had of a comeback. “We’re very pleased with our performance, and the last two games,” said Monk. “Two tough away trips and two really competitive games, but I think we’ve showed what we’re capable of. “I keep saying about finding the balance between attacking and defending and I think we did both well today. Striker Braithwaite was delighted with the victory, telling mfc.co.uk: “It was a good team performance. We put them under pressure and we keep gaining confidence – you could see that on the pitch. The opener came when Hull’s Kevin Stewart failed to control a loose ball on the edge of his area and was swiftly dispossessed by an opportunistic Braithwaite, who drilled low across Allan McGregor and into the net. Hull sub Nouha Dicko should have halved the deficit, but he shot straight at Darren Randolph, though they got one back through Grosicki’s sublime half-volley on the edge of the area. But a comeback was dashed when Leadbitter scored from the spot five minutes from time after Fletcher was upended from behind by last-man Hector, who was red-carded. Hull are six points clear of the drop zone but dejected boss Leonid Slutsky admitted he has fallen short of his own expectations and would have no complaints if he was sacked by owner Assem Allam. Hull: McGregor, Tomori, Dawson, Hector, Clark, Meyler, Stewart (Dicko 46), Bowen, Larsson (Grosicki 53), Irvine, Campbell (Diomande 67). Subs Not Used: Marshall, Henriksen, Lenihan, Aina. Sent Off: Hector (83). Booked: Irvine, Grosicki. Goals: Grosicki 72. Middlesbrough: Randolph, Christie, Ayala, Gibson, Da Silva (Friend 11), Howson, Leadbitter, Downing, Braithwaite, Tavernier (Johnson 71), Assombalonga (Fletcher 79). Subs Not Used: Konstantopoulos, Fry, Forshaw, Traore. Booked: Ayala, Howson. Goals: Braithwaite 13, Assombalonga 36, Leadbitter 85 pen. Att: 15,454. Ref: Tim Robinson.